In vestors had something more to cheer about this week as the NASDAQ Composite Index finally surpassed its prior high of 5048 set during the Dot Com bubble in March 2000. It has been a long journey since then as the tech-heavy index sunk as low as 1100 in 2002. With this week’s landmark, a $1,000 investment into the NASDAQ at that March 2000 peak is now once again worth the original $1000 invested. Or is it? After inflation, or in “real” terms, that $1,000 today is worth the equivalent of just $715 in March 2000 dollars. 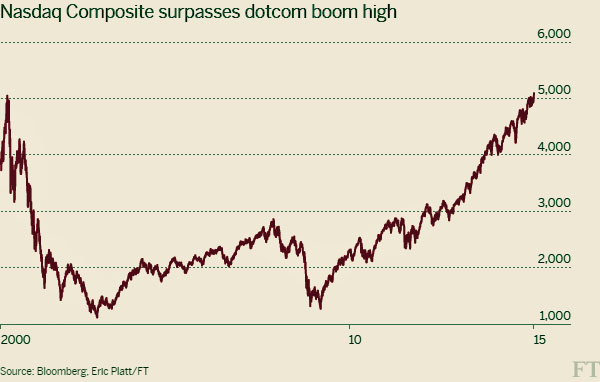 So NASDAQ investors of March 2000, you are not back to par just yet. Breakeven for you, after inflation, would require the index to be at 7,000 today, not 5000. On the flip side of this trying tale, an investor who fought off the overwhelming urge to flee risk in early 2009 and invested into the NASDAQ at the depths of the financial crisis would be sitting pretty, with $4,000 today for every $1,000 invested then. Timing is everything I guess. But how to judge timing? There is no proven way I know to get the timing anywhere close to spot on in advance. But valuations are a useful, if highly imperfect, tool. Valuations were almost as compelling in early 2009 as they were terrifying in early 2000. However, investing in stocks in early 2009 essentially meant “running into a burning building,” while getting out of the market during the Dot Com bubble risked looking like a fool. In the context of a market flowing irresistibly either higher, or lower, investing with a valuation discipline often means running counter to conventional wisdom. This can be very very difficult, and it can be costly in the short-term, even for professional investors. The Financial Times cites a recent report from Bank of America showing a dramatic surge of funds into global equities in 2013. Dramatic moves like this (see 2008) can be one signal of a market that has reached an extreme. The classic contrarian warning sign for stock prices. Is the decade-plus run in fixed income reaching its end? In a way, today’s bond market feels like the 1999 stock market, when technology companies were all the rage… Three decades ago people hated bonds. Yields of 15 percent for 30 years were considered certificates of confiscation. Investors thought governments couldn’t be trusted, $150 billion deficits were too high and 4 or 5 percent money supply growth was too much. Therefore, they didn’t want to lock up money at 15 percent. The risk is exceptionally high. If things go well for bond holders, the potential reward is 3 percent per year for 30 years. If things don’t go well and rates return to 15 percent, bond holders would lose more than three-quarters of their money. This is return-free risk. This is a challenge for those who must meet retirement needs, or meet the needs of endowments, foundations and pension plans. Where can one go? Various places, including alternatives and real estate – and of course the stock market. A colleague wrote last month, “while I am not overly attracted by what I consider a stock market that is fully valued, I held my nose and bought.” No less than Warren Buffett has advised that stocks are poised to return to outperforming bonds in the years ahead. Not without volatility of course, and investors should carefully calibrate their own needs and risk tolerances. But given the near-inevitability of mean reversion (or “anything that can’t go on forever, won’t”), the probability of bonds continuing to outperform stocks in the coming decade is small indeed.